Unlike the original Ragnarok Online, the equipment quality in RO2 are color graded. Slot system also exist , but there are called rune hole and you can put runes instead of cards. The most basic equipment is white. However don't waste your money buying them as you can easily get free and better equipment from quest. Where to get : NPC ; weapon merchant, heavy armor merchant etc. Noticed that the description is longer than white grade. Because they also add stats, which are very useful. Using a lower level green is much better than using whites. 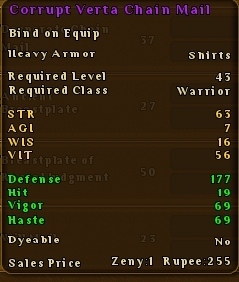 see below, 57 STR will add 114 physical attack and 58 VIT give around 290 extra hp. Where to get : Normal quest, monster drop, or craft by blacksmith. Remark : Bind on equips BOE, which mean it will be bounded to your character only once equipped. The stat given are pretty much the same as green grade. However, they will be 2 more effect. Either Vigor + Haste or Dodge +Parry. This differentiate between dps and tanking capabilities. 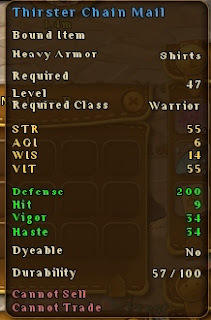 The first combination is better for dps build as vigor reduce cool down of skill and haste reduce skill casting time. Second combination is perfect for tanking as dodge will obviously increase dodge toward attack, and parry reduce the damage received. Remark : Bound item, once you pick it, nontransferable . Trade from npc also non-transfer . 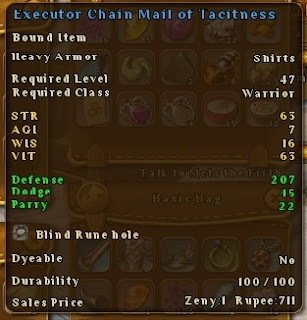 However, crafted equips is BOE. Below is another blue equip, which have blind rune hole. 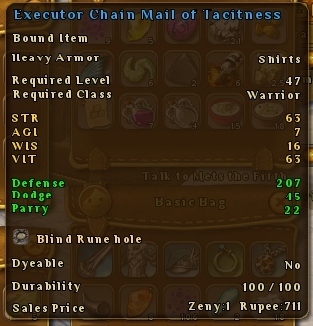 This one is dropped from dungeon boss. If you look carefully, the stats are much better. This type is always bound on pickup. Purple Equips *The information here could be wrong as i haven't manage to find/get purple equip personally. Purple is the best grade so far. Purple equip have even more extra effect (haste+vigor or dodge+parry) compared to blue. 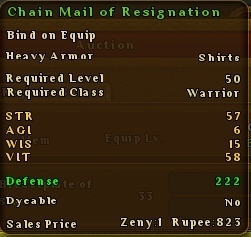 Purple equipment are very rare and expensive, and i believe they are dropped from raid (in form of token, where you can exchange from npc) and also from crafting. In RO2Sea, i have seen some recipe in auction price, and the price are super expensive. Plus, the material needed are also very hard to find. The good thing is, they are usually crafted with 1 or 2 rune holes, and BOE. I haven't manage to get any purple or join any raid . The information that i have now is limited to what i have personally experience. I will update this once i got more information/experience.